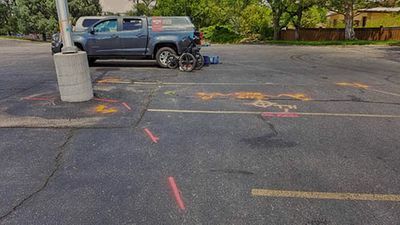 A local environmental company in Fort Collins was needing to drill a hole through the asphalt at a golf course to monitor the soil conditions below. Before they could perform the work, they needed to have the area scanned with GPR to make sure the area was clear of any obstructions, so there were no surprises when they drill blindly into the earth. The subject area that was scanned was roughly 10’ x 25’ in size and sat right next to a light pole which gave them concerns about the power running through the area. Also, not in the picture is a building roughly 30’ away that had a bunch of utilities exiting the side of the building going into the ground, heading in a direction that nobody knew where they were running. So along with using the GPR we also used a transmitter with a locating wand to put a tone on those utility lines to verify they did not run through the subject area. By having GPRS out to clear the area prior to drilling, we were able to mark out all of the utilities in the general vicinity to give them a peace of mind that they won’t hit anything while drilling the hole. This also saves a lot of money in repairs had they not scanned first and then cut through a power line or communication line example. Along with marking all findings on the ground with either pin flags or paint, GPRS also offers a service of collecting all the findings with a GPS and putting it into a google earth overlay for future reference. We can typically have the google earth overlay to the customer in 3 to 4 business days. If you are interested in learning more about our concrete imaging capabilities or other Ground Penetrating Radar applications such as locating Utilities and sub-surface anomalies along a proposed pipeline trench, locating underground storage tanks (USTs), clearing boring locations of possible Utilities for soil samples, void detection or even structural investigations. Don’t hesitate to contact us for more information or to hire us for your next project no matter how big or small the project may be. Ground Penetrating Radar Systems has an office local in Denver, CO serving all of Colorado and Wyoming, as well as having offices all across the U.S in all major cities and states. Please feel free to contact our Denver office at (303) 775-8270 or contact Troy Bullock direct at (720) 688-1362, you can also email me at troy.bullock@gprsinc.com.